I am very flattered to find out that not only is my x$ OpenNTF xSnippet being used more widely than I realized (over 600 downloads). It now being used in the latest release of the OpenNTF Extension library. Who knew my first foray into the XPages community would have such an impact. The lesson here boys and girls should be that you should *share* your work however small and insignificant you think it is. Like all scientific research, very little code is “a completely new way of doing things”. Generally everything grows incrementally and just because you don’t think something is significant, someone else might. You are reading this – what have you shared recently? jQuery in XPages #3 – Masked Input – How does it work? 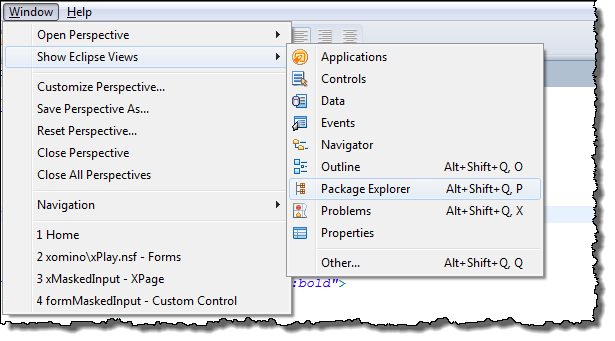 You now have a re-usable custom control which can be added to any of the XPages in your database. 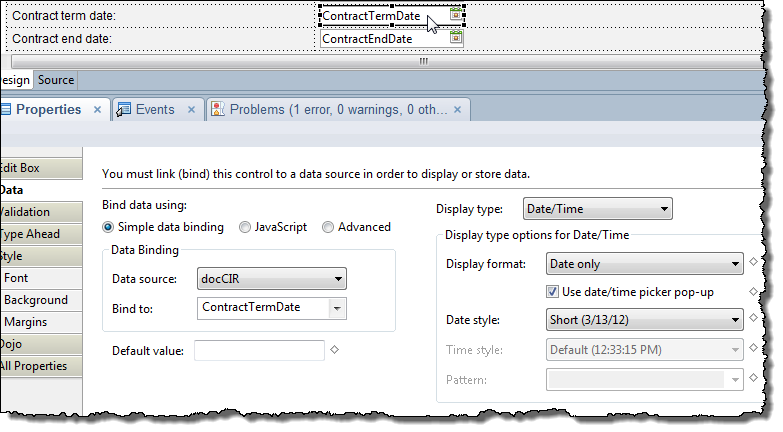 Create a new XPage and create a new Domino Document data source from one of the forms in the database. And it’s as easy as that ! Updates the mask accordingly and moves past the “Mask” characters is applicable. This week we are going to look at a Masked Input plugin which provides another easy to implement but big impact to the users interface improvement capability. The Input Mask adds the (__) ___-____ x_____ into the field and as the user starts to type the “Mask” is replaced by the keyed value. Adding this plug in to your database will take less than 5 minutes and you can improve the user interface immediately. Check out The Masked Input website for more information and futher information on the API parameters/capabilities. Note:When you are submitting the form you will still need to validate it as the Input Mask does not handle validation outside of the field itself. 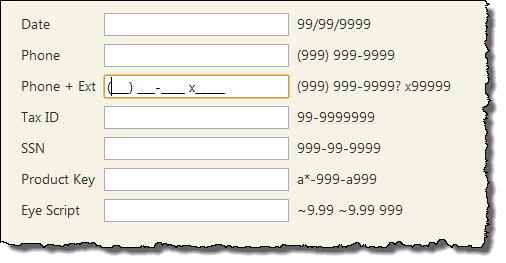 The whole field value is submitted (Input Mask value as well) so if you create a (123) 123-1234 mask you will need to make sure you can accept that on the back end in a text field and you don’t need a 9 digit number. Thanks to Sven Hasselbach who inadvertently gave me the information I needed to intercept the ajax call in dojo. I was able to intercept the ajax call being made to the server. As I previously discussed in the original article I knew that the response was blank but was unable to get a handle on it – now I have. When using a date picker in an XPage, user’s can still type incorrect data into the field which requires validation when saving. Don’t let them type anything into the field and provide the calendar picker when they click into the field. But when that translates onto the webpage, the user can still type in the field and enter any old rubbish, which then needs to be validated. We can achieve this by adding a simple function to the onClientLoad event of the XPage. First we have to look at the created HTML for the date control in the webpage. What we can decipher is that the XPage has created a <SPAN> container (amongst other things) around the Edit Box and the Calendar Button. However, we do not know the name of the function which is called when the button is clicked (it is dynamically created as part of the dijit widget). We do not need to know the function name because we can programmatically trigger the onClick event of the button. Today marks the release of my first video for Notes in 9. It has been my absolute pleasure to work with David Leedy on this project and I really hope that people find it useful. This blog entry is intended for my side-notes and also to provide a spot for any questions/comments. 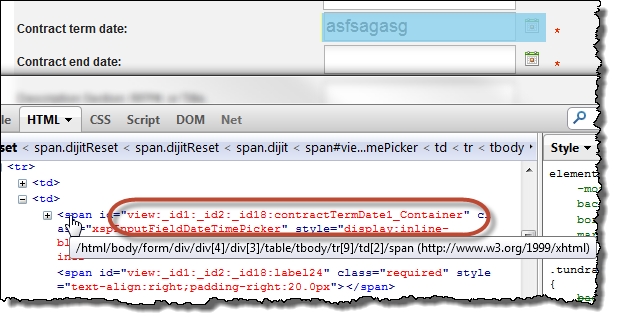 This came about after my blog article on Adding a “working” visual indicator to the XPages TypeAhead. David approached me because he thought it would make a great Nin9 video. The original article was written from code on an 8.5.2 server and when I went to make the video on my 8.5.3 server I found that the HTML code generated for the type ahead was different any my code was “broken”. As i said at the start of the original article, this is not bullet proof because you are always at the risk of this happening because we are manipulating the HTML created by the server. When IBM release 8.5.3 they upgraded dojo to 1.6 from 1.4 and the way the dijit comboxbox works had changed from one version of dojo to another, so IBM had to adapt. The code in the example will work for 8.5.3 and 8.5.2 however because of the beauty of using the dojo.query. The 8.5.2 version is less complex and a couple of the lines in the addVisual() function are irrelevant. Because we are working with the dojo.query selector, and it find nothing to action on in the 8.5.2 HTML code, it does nothing – and most importantly fails over gracefully!! jQuery in XPages #1 – Highcharts – How does it work? This how does it work article is a follow on from the original jQuery in XPages #1 – Highcharts and goes into depth as to how the functionality was created and how you can modify it yourself. Be fore-warned this is quite dry and not for the faint of heart, but hopefully will provide a good insight and understanding. To avoid making this article long(er than it already is) I am going to focus just on the drawHighchart custom control and the Highchart theme. The sample database is available for download and you can pick it to pieces at your leisure. This custom control is intended to be self contained for the sake of this demonstration and can be dropped onto any XPage in your application. The example has a dropdown for theme and graph type choices. These parameters are fed into the Highchart.js file based on the selected field values, but in your application where you only want a specific chart type they could be hard-coded. Later in the article you will see where the parameters are fed into the highchart.js library and how you can configure them yourself. Both the chart theme and chart type fields have a full refresh set on the “onchange” event. This reloads the page and data when a change is made. Again for the sake of a demonstration this is ok, but in your real-world application you would only provide one chart type and remove these drop downs. * for category names. This function is based on jQuery.